I soon received a similar request from Diane Flowers and went looking for the recipe. I have The Jackson Cookbook, a superb collection with an introduction by Eudora published in 1975, but kept missing the recipe until a neighbor who is a native Jacksonian pointed it out to me (Thanks, Margaret!) 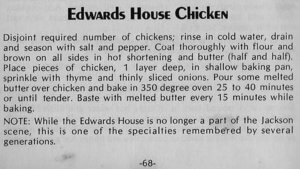 In my defense, the recipe is credited to the “Edwards House”—as opposed to the King Edward Hotel—and I’m not really sure why. 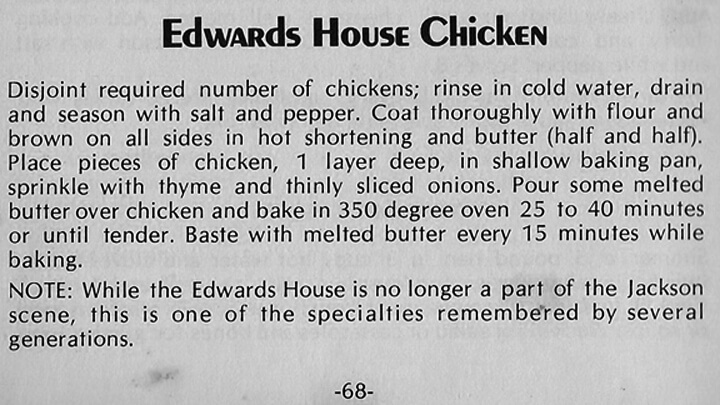 Perhaps the hotel restaurant was called the “Edwards House” though given the suspiciously archaic phrasing the recipe may date back to the early quarter of the century, which makes it really special indeed, an indication of the level of culinary hospitality in the city at that time. 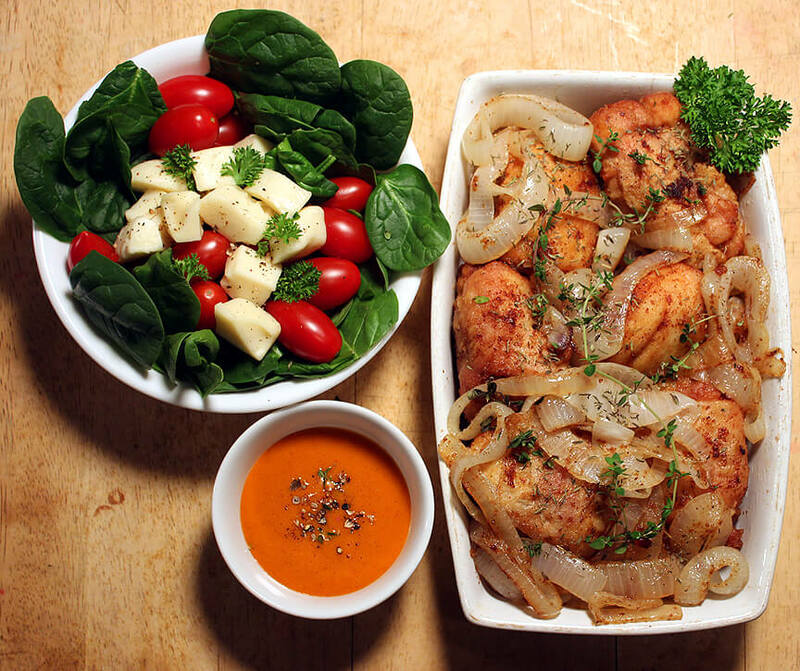 The recipe is a classic fricassee, chicken fried and braised, simple yet rich, with a sublime aroma, all characteristic of haute cuisine of the sort you’d expect to have found in an establishment such as the King Edward in its heyday. Sombra said she doesn’t bread her chicken at all, that the onions were sliced thick enough not to singe and that basting is crucial. Me, I used boneless thighs skewered and lightly floured (no drenching beforehand) with salt and pepper, the beautiful early yellow onions we have coming to market now and a mixture of green and dried thyme. Use a medium heat—the butter will burn if too hot—and give the chicken a good browning. I wilted the onions in the oil/butter before topping the chicken, drizzle with more of the mix and placed it in a medium (350) oven for about half an hour.